H&M dress (also seen here), Zara necklace (found in store), vintage leather bomber (we like this one too), thrifted sunglasses, Camilla Skovgaard heels, Rebecca Minkoff snakeskin flirty (last seen here). So, funny story about this dress. I've had it for 4 years and it's been worn exactly twice - the first time by Lauren during which it was documented in our second ever outfit post (to go down memory lane you can check out how she wore it here) and now for the second time almost two years later by me. But we all have pieces like this in our closet right? It seems like such a great purchase at the time but for some reason you never really get around to wearing it. Well with 2014 almost here (WHAT.) I'm doing a serious cleanse of my closet and I decided to finally give this dress a chance before putting it in one of the sell/donate/trash piles. I don't generally wear bright things so this was new and kind of refreshing and ultimately... I decided that it was a keeper. It's really a lovely dress and it's sure is a keeper lol. you look awesome! bright and snazzy! Love the pop of yellow! Great outfit! I love yellow this time of year! What a gorgeous colour, love how you styled it! Love the combination of black and yellow!! So edgy! We sure do, I need to venture into my own more often. Loving this look, super fierce! You have such a classy style! I love this pop of yellow :) I usually don't wear bright pieces either, but you definitely made this one look fabulous!! Such a perfect combo!!! This dress and jacket- wonderful!!!! I love yellow colour. It´s vibrant! This yellow dress is stunning! 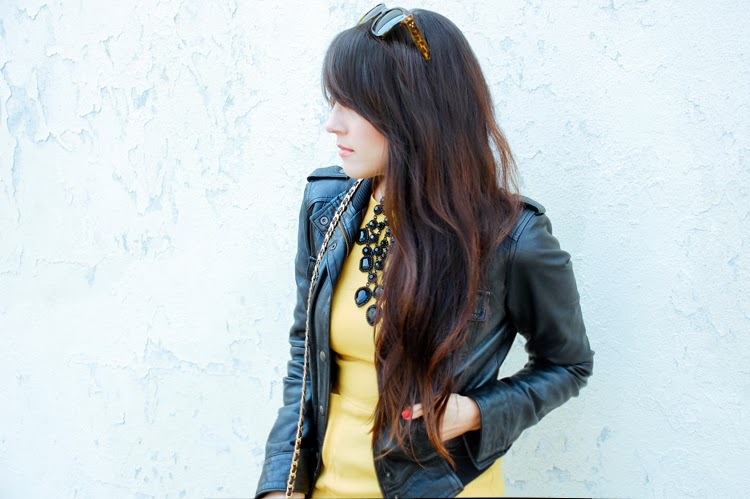 Love with the biker jacket! Love the yellow looks so good on you!